Kryptonian Warrior: Samuel L Jackson May Not Return As Nick Fury? 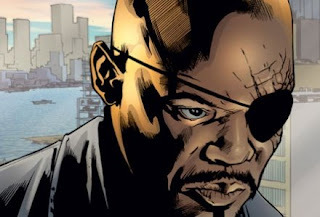 One of the best and most talked about moments in the 2008 Iron Man movie was Samuel L Jackson's cameo in the post credit scene introducing himself to Tony Stark as Colonel Nick Fury of S.H.E.I.L.D and inviting him to join the Avengers Initiative. It was a done deal in every fanboy's head that Sammy boy would reprise his role in the upcoming 2011 Avengers movie, or at least have another Marvel movie cameo. Unfortunately though it seems that the talks between Marvel Studios and Sam's agents broke down and the job may well now fall into the hands of another actor, or the role gets written out completely... Not good news. Let's hope David Hasslehoff isn't set to reprise his old 1998 Fury role!!!! Hopefully the red tape will all be ironed out before things go ahead, I can't see anyone else having the presence or skill Sam could potentially bring to what is slowly building up to be one of the best and most anticipated movies of all time.